In this week's So Many Fairies story, “The Magic in Ward 4”, Little Suzie must spend a few weeks in the hospital. What’s worse, because of her illness, she must stay in a room by herself. But she hears from one of the nurses that magical things can happen in this particular children’s ward, and—if she pays attention—she might discover them, too. Suzie does pay attention, and, one night, a small man comes into her room and begins polishing her window, making the moonlight coming through it sparkle. His “fairy brightening and magic dusting” is just the start of the magic. 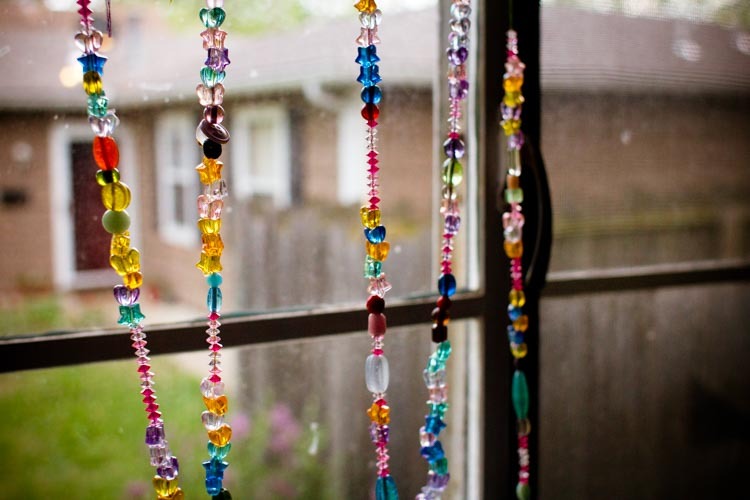 This week's craft project—a beaded light catcher—isn't a magic polish, but it will transform the light coming in your window into beautiful colors. What's more, it would be a great boredom buster for a kiddo who's feeling under the weather. 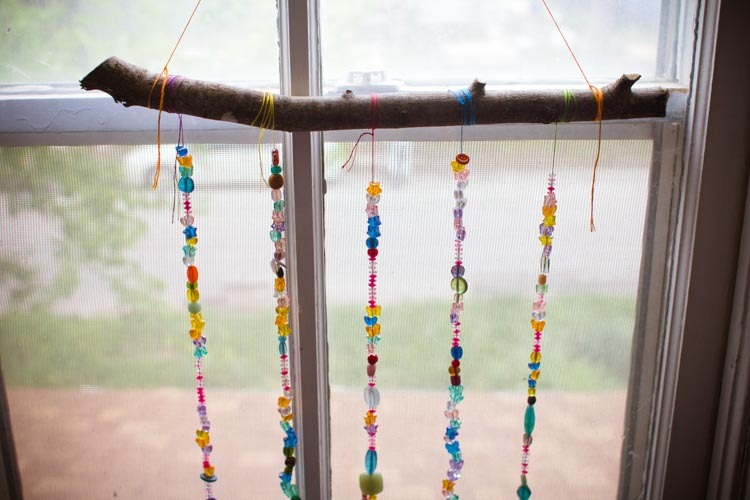 This light catcher will end up prettier if you use beads that are a bit eclectic, so this is a great time to use up a few beads leftover from another project or the leftover pieces of that broken necklace. I even raided my button stash. 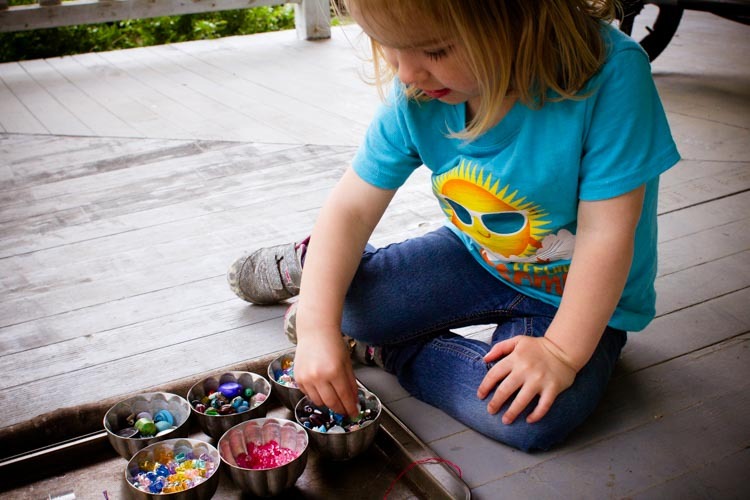 First, make sure you encourage your kids to mix heavier beads with lighter beads on each strand, so that the weight is evenly distributed at the end. 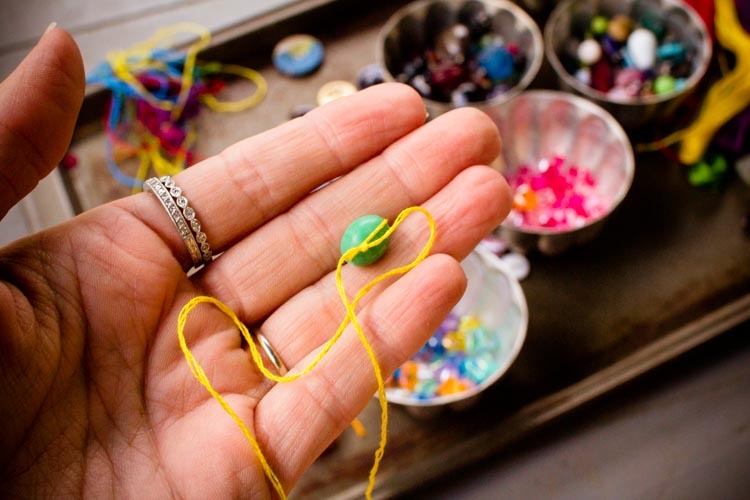 Second, if you're working with pre-schoolers, think about getting larger beads (and maybe using a blunt yarn needle and sock weight yarn to string them) to compensate for younger kids' not-quite-as-developed dexterity. Whatever combination of beads and string you use, they key is to make sure the needle will fit through the holes in the beads. As long as that works, you'll be golden! Or sparkly. Or rainbow. Or whatever other lovely colors you decide to string together! Cut a piece of embroidery floss to about the length of your arm. To be sure the floss will go through the beads, divide it in half so that you're only working with three strands. Then, thread the floss through the needle. 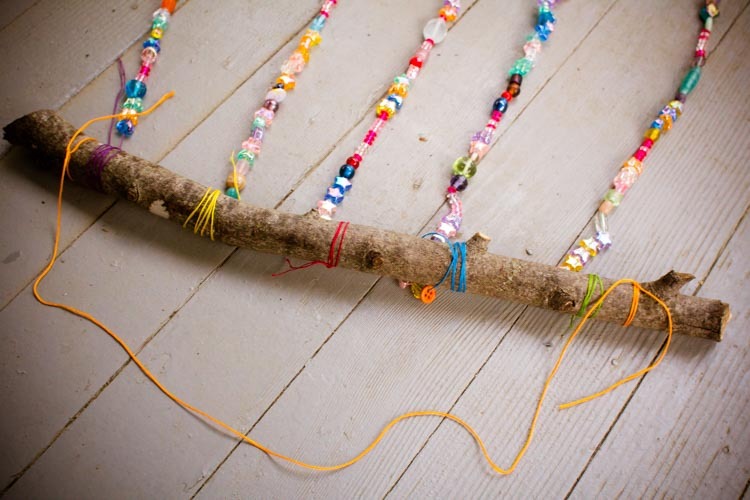 Choose a large bead to tie to the end of the floss. This will act as a stopper to keep the rest of the beads from falling off. Then, string on your beads. While you can make the bead strands as long as you like, I found that they started to get heavy and unwieldy after about 12-16 inches of beads. 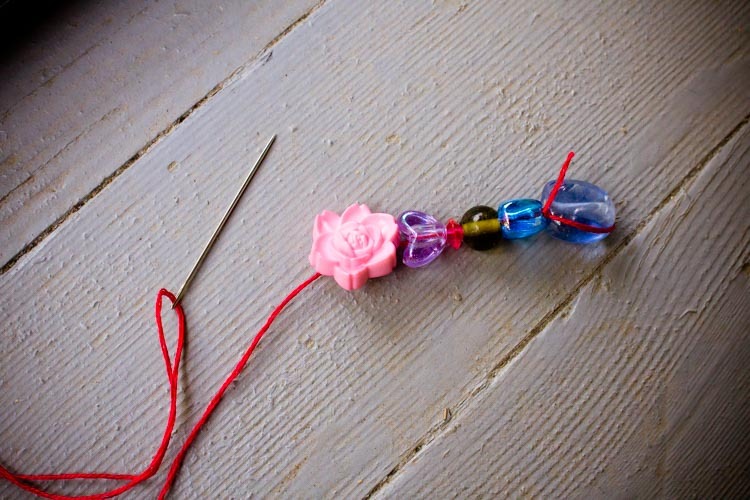 When you've finished stringing your beads, remove the floss from the needle, and wrap the floss a few times around the stick before tying a knot to hold it in place. 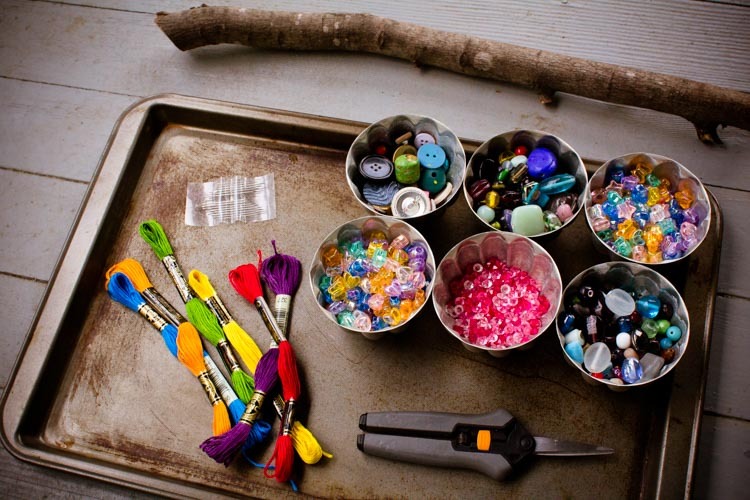 Repeat this process with more strands of floss and beads, until your light catcher is as full as you'd like it to be. Then, tie an undivided length of floss (so, use all six strands) to both ends of the stick, to make a hanger. Put your light catcher in a bright window and enjoy the sparkly light! There are so many magical beings in the world: stone beings, air fairies, wood elves, fire sprites. Most of us cannot see or hear them, but sometimes — especially when we are very young — we can. Each week in So Many Fairies, children will enter the magic of the natural world, encounter fairy folk, and meet questions of ecology and sustainability with their imaginations.